LONDON: Moeen Ali again proved England´s hero with the bat as they beat West Indies by six runs in a rain-marred fourth one-day international at The Oval to go an unbeatable 3-0 up with one to play in the series. Defeat was also tough on West Indies paceman Alzarri Joseph, who took all of England´s wickets during an ODI best haul of five for 56. 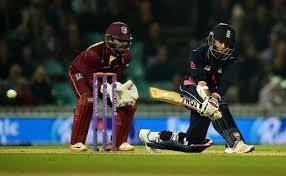 “Evin set the tone for us up front,” said West Indies captain Jason Holder. “Unfortunately he was unable to bat in the last few overs. Lewis´s innings, which surpassed his previous ODI hundred of 148 against Sri Lanka in Bulawayo in November last year, was the cornerstone of West Indies´ 356 for five. The Windies had slumped to 33 for three following Chris Woakes´s treble strike that included the fourth ball exit of Lewis´s fellow left-handed opener Chris Gayle who made a dashing 94 in Bristol. They knew they would be without all-rounder Stokes — included in the Ashes party and retained as Test vice-captain — after his arrest in the early hours of Monday morning. “We´ve always policed it ourselves, (but) it´s something we´re going to look into — in light of what´s happened — because we need to look after each other as a team,” he said. Often billed as Gayle´s heir apparent, Lewis — a far shorter and less muscular batsman — hit two sixes in as many balls off fast bowler Liam Plunkett, the second a magnificent straight drive. Roy, only recalled after fellow opener Alex Hales was omitted together with Stokes after the pair were out late prior to the latter´s arrest, cashed in with 84 on his Surrey home ground.